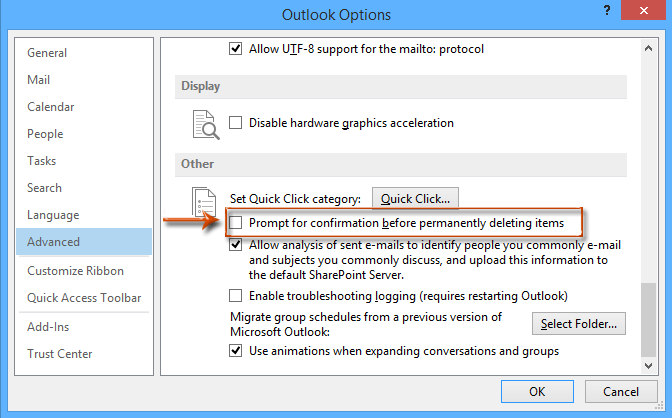 How to disable permanently deleting confirmation in Outlook? By default, when we delete an email message permanently with pressing the Shift + Delete keys simultaneously, it will pop up a permanently delete confirmation shown as following screen shot. Some Outlook users may think it annoyed and want to disable the warning dialog box. In this article, I will introduce the ways about how to disable the permanently deleting confirmation in Outlook easily. 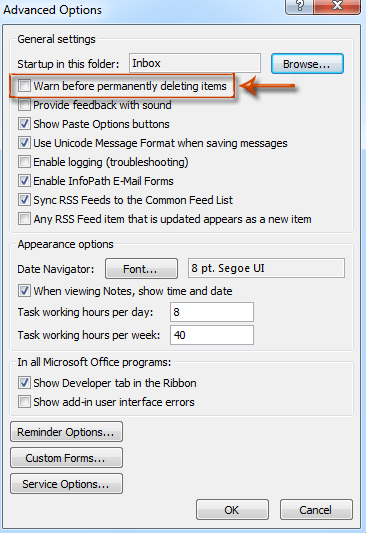 If you are using Microsoft Outlook 2010 and 2013, you can follow this way to disable the permanently deleting confirmation quickly. Step 1: Click the File > Options. Step 3: Click the OK button to close this dialog box. From now on, the permanently deleting confirmation dialog box won’t come out when you permanently delete any item from Microsoft Outlook 2010 and 2013. Step 1: Click the Tools > Options. Step 2: In the Options dialog box, click the Advanced Options button on the Other tab. Step 3: In the coming Advanced Options dialog box, uncheck the option of Warn before permanently deleting items. Step 4: Click both OK buttons to close two dialog boxes. How to disable permanently delete sound in Outlook? don't have those options. Not an answer that works. Thank you. I've always wanted to eliminate the permanently delete an item confirmation, but never knew how to change it. Great tip. Can you please tell me how to turn this off. I've found several topics on how to turn off dialog boxes when deleting items in folders but not the folder itself. For example when I want to delete a folder I get a message like "Move "folderxxxx" to your Deleted Items folder. Once I move it and delete it I get asked again. Can you please tell me how to turns these off! Suppressing the confirmation prompt works fine for Shift-Delete, but in Outlook 2013 there is a Permanently Delete command that can be set as a Quick Step, and - so far as I can see - the confirmation prompt suppression check box has no effect on it. Clicking the Quick Step "Permanently Delete" still comes up with a confirmation prompt, while no such prompt comes when using Shift-Delete. Any suggestions as to how to get rid of the prompt altogether?